Dutch West India Company (Dutch: Geoctroyeerde Westindische Compagnie, Dutch pronunciation: [ɣəʔɔktroːˈjeːrdə ʋɛstˈɪndisə kɔmpɑˈɲi] or Dutch: WIC; English: Chartered West India Company) was a chartered company (known as the "WIC") of Dutch merchants as well as foreign investors. 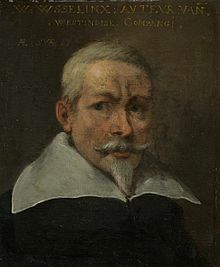 Among its founders was Willem Usselincx (1567–1647). On June 3, 1621, it was granted a charter for a trade monopoly in the Dutch West Indies by the Republic of the Seven United Netherlands and given jurisdiction over Dutch participation in the Atlantic slave trade, Brazil, the Caribbean, and North America. The area where the company could operate consisted of West Africa (between the Tropic of Cancer and the Cape of Good Hope) and the Americas, which included the Pacific Ocean and the eastern part of New Guinea. The intended purpose of the charter was to eliminate competition, particularly Spanish or Portuguese, between the various trading posts established by the merchants. The company became instrumental in the largely ephemeral Dutch colonization of the Americas (including New Netherland) in the seventeenth century. From 1624 to 1654, in the context of the Dutch-Portuguese War, the WIC held Portuguese territory in northeast Brazil, but they were ousted from Dutch Brazil following fierce resistance. After several reversals, WIC reorganized and a new charter was granted in 1675, largely on the strength in the Atlantic slave trade. This "New" version lasted for more than a century, until after the Fourth Anglo-Dutch War, during which it lost most its assets. When the Dutch East India Company (VOC) was founded in 1602, some traders in Amsterdam did not agree with its mono politics. With help from Petrus Plancius, a Dutch-Flemish astronomer, cartographer and clergyman, they sought for a northeastern or northwestern access to Asia to circumvent the VOC monopoly. In 1609, English explorer Henry Hudson, in employment of the VOC, landed on the coast of New England and sailed up what is now known as the Hudson River in his quest for the Northwest Passage to Asia. However, he failed to find a passage. Consequently, in 1615 Isaac Le Maire and Samuel Blommaert, assisted by others, focused on finding a south-westerly route around South America's Tierra del Fuego archipelago in order to circumvent the monopoly of the VOC. One of the first sailors who focused on trade with Africa was Balthazar de Moucheron. The trade with Africa offered several possibilities to set up trading posts or factories, an important starting point for negotiations. It was Blommaert, however, who stated that, in 1600, eight companies sailed on the coast of Africa, competing with each other for the supply of copper, from the Kingdom of Loango. Pieter van den Broecke was employed by one of these companies. In 1612, a Dutch fortress was built in Mouree (present day Ghana), along the Dutch Gold Coast. Trade with the Caribbean, for salt, sugar and tobacco, was hampered by Spain and delayed because of peace negotiations. Spain offered peace on condition that the Dutch Republic would withdraw from trading with Asia and America. Spain refused to sign the peace treaty if a West Indian Company would be established. At this time, the Dutch War of Independence (1568–1648) between Spain and the Dutch Republic was occurring. 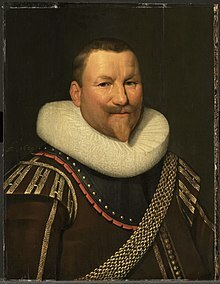 Grand Pensionary Johan van Oldenbarnevelt offered to only suspend trade with the West in exchange for the Twelve Years' Truce. The result was that, during a few years, the company sailed under a foreign flag in South America. However, ten years later, Stadtholder Maurice of Orange, proposed to continue the war with Spain, but also to distract attention from Spain to the Republic. In 1619, his opponent Johan van Oldenbarnevelt was beheaded, and when two years later the truce expired, the West Indian Company was established. The West India Company received its charter from the States-General in 1621, but its foundation had been suggested much earlier in the 17th century only to be delayed by the conclusion of the Twelve Years' Truce between Spain and the United Provinces in 1609. The Dutch West India Company was organized similarly to the Dutch East India Company (VOC). Like the VOC, the WIC company had five offices, called chambers (kamers), in Amsterdam, Rotterdam, Hoorn, Middelburg and Groningen, of which the chambers in Amsterdam and Middelburg contributed most to the company. The board consisted of 19 members, known as the Heeren XIX (the Nineteen Gentlemen). The institutional structure of the WIC followed the federal structure, which entailed extensive discussion for any decision, with regional representation: 8 from Amsterdam; 4 from Zeeland, 2 each from the Northern Quarter (Hoorn and Enkhuizen), the Maas (Rotterdam and Dordrecht), the region of Groningen, and one representative from the States General. Each region had its own chamber and board of directors. The validity of the charter was set at 24 years. Only in 1623 was funding arranged, after several bidders were put under pressure. The States General of the Netherlands and the VOC pledged one million guilders in the form of capital and subsidy. Although Iberian writers said that crypto-Jews or Marranos played an important role in the formation of both the VOC and the WIC, research has shown that initially they played a minor role, but expanded during the period of the Dutch in Brazil. Emigrant Calvinists from the Spanish Netherlands did make significant investments in the WIC. Investors did not rush to put their money in the company in 1621, but the States-General urged municipalities and other institutions to invest. Explanations for the slow investment by individuals were that shareholders had "no control over the directors' policy and the handling of ordinary investors' money," that it was a "racket" to provide "cushy posts for the directors and their relatives, at the expense of ordinary shareholders." The VOC directors invested money in the WIC, without consulting their shareholders, causing dissent among a number of shareholders. In order to attract foreign shareholders, the WIC offered equal standing to foreign investors with Dutch, resulting in shareholders from France, Switzerland, and Venice. A translation of the original 1621 charter appeared in English, Orders and Articles granted by the High and Mightie Lords the States General of the United Provinces concerning the erecting of a West-Indies Companie, Anno Dom. MDCXII. by 1623, the capital for the WIC at 2.8 million florins was not as great the VOC's original capitalization of 6.5 million, but it was still a substantial sum. The WIC had 15 ships to carry trade and plied the west African coast and Brazil. Unlike the VOC, the WIC had no right to deploy military troops. When the Twelve Years' Truce in 1621 was over, the Republic had a free hand to re-wage war with Spain. A Groot Desseyn ("grand design") was devised to seize the Portuguese colonies in Africa and the Americas, so as to dominate the sugar and slave trade. When this plan failed, privateering became one of the major goals within the WIC. The arming of merchant ships with guns and soldiers to defend themselves against Spanish ships was of great importance. On almost all ships in 1623, 40 to 50 soldiers were stationed, possibly to assist in the hijacking of enemy ships. It is unclear whether the first expedition was the expedition by Jacques l'Hermite to the coast of Chile, Peru and Bolivia, set up by Stadtholder Maurice with the support of the States General and the VOC. The company was initially a dismal failure, in terms of its expensive early projects, and its directors shifted emphasis from conquest of territory to pursue plunder of shipping. The most spectacular success for the WIC was Piet Heyn's seizure of the Spanish silver fleet, which carried silver from Spanish colonies to Spain. He had also seized a consignment of sugar from Brazil and a galleon from Honduras with cacao, indigo, and other valuable goods. Privateering was its most profitable activity in the late 1620s. Despite Heyn's success at plunder, the company's directors realized that it was not a basis to build long-term profit, leading them to renew their attempts to seize Iberian territory in the Americas. They decided their target was Brazil. There were conflicts between directors from different areas of The Netherlands, with Amsterdam less supportive of the company. Non-maritime cities, including Haarlem, Leiden, and Gouda, along with Enkhuizen and Hoorn were enthusiastic about seizing territory. They sent a fleet to Brazil, capturing Olinda and Pernambuco in 1630 in their initial foray to create a Dutch Brazil, but could not hold them due to a strong Portuguese resistance. Company ships continued privateering in the Caribbean, as well seizing vital land resources, particularly salt pans. The company's general lack of success saw their shares plummet and the Dutch and The Spanish renewed truce talks in 1633. In 1629 the WIC gave permission to a number of investors in New Netherlands to found patroonships, enabled by the Charter of Freedoms and Exemptions which was ratified by the Dutch States-General on June 7, 1629. The patroonships were created to help populate the colony, by providing investors grants providing land for approximately 50 people and "upwards of 15 years old", per grant, mainly in the region of New Netherland. Patroon investors could expand the size of their land grants as large as 4 miles, "along the shore or along one bank of a navigable river..." Rensselaerswyck was the most successful Dutch West India Company patroonship. The New Netherland area, which included New Amsterdam, covered parts of present-day New York, Connecticut, Delaware, and New Jersey. Other settlements were established on the Netherlands Antilles, and in South America, in Dutch Brazil, Suriname and Guyana. In Africa, posts were established on the Gold Coast (now Ghana), the Slave Coast (now Benin), and briefly in Angola. It was a neo-feudal system, where patrons were permitted considerable powers to control the overseas colony. In the Americas, fur (North America) and sugar (South America) were the most important trade goods, while African settlements traded the enslaved (mainly destined for the plantations on the Antilles and Suriname), gold, and ivory. In North America, the settlers Albert Burgh, Samuel Blommaert, Samuel Godijn, Johannes de Laet had little success with populating the colony of New Netherland, and to defend themselves against local Amerindians. Only Kiliaen Van Rensselaer managed to maintain his settlement in the north along the Hudson. Samuel Blommaert secretly tried to secure his interests with the founding of the colony of New Sweden on behalf of Sweden on the Delaware in the south. The main focus of the WIC now went to Brazil. Only in 1630 did the West India Company manage to conquer a part of Brazil. In 1630, the colony of New Holland (capital Mauritsstad, present-day Recife) was founded, taking over Portuguese possessions in Brazil. In the meantime, the war demanded so many of its forces that the Company had to operate under a permanent threat of bankruptcy. In fact, the WIC went bankrupt in 1636 and all attempts at rehabilitation were doomed to failure. Because of the ongoing war in Brazil, the situation for the WIC in 1645, at the end of the charter, was very bad. An attempt to compensate the losses of the WIC with the profits of the VOC failed because the directors of the VOC did not want to. Merging the two companies was not feasible. Amsterdam was not willing to help out, because it had too much interest in peace and healthy trade relations with Portugal. This indifferent attitude of Amsterdam was the main cause of the slow, half-hearted policy, which would eventually lead to losing the colony. In 1647 the Company made a restart using 1.5 million guilders, capital of the VOC. The States General took responsibility for the warfare in Brazil. Due to the Peace of Westphalia the seizing of Spanish ships was no longer allowed. Many merchants from Amsterdam and Zeeland decided to work with marine and merchants from Hamburg, Glückstadt (then Danish), England and other countries. In 1649, the WIC obtained a monopoly on gold and enslaved Africans in the kingdom of Accra (present-day Ghana). In 1662 there were contacts with the owners of the Asiento, which were obliged to deliver 24,000 enslaved Africans. In 1663 and 1664 the WIC sold more enslaved Africans than the Portuguese and English together. The first West India Company suffered a long agony, and its end in 1674 was painless. The reason that the WIC could drag on for twenty years was due to its valuable West African possessions, due to its slaves. When the WIC could not repay its debts in 1674, the company was dissolved. But because of high demand for trade with the West (mainly slave trade), and the fact that still many colonies existed, it was decided to establish the Second Chartered West India Company (also called New West India Company) in 1675. This new company had the same trade area as the first. All ships, fortresses, etc. were taken over by the new company. The number of directors was reduced from 19 to 10, and the number of governors from 74 to 50. The new WIC had a capital that was slightly more than 6 million guilders around 1679, which was largely supplied by the Amsterdam Chamber. From 1694 until 1700, the WIC waged a long conflict against the Eguafo Kingdom along the Gold Coast, present-day Ghana. The Komenda Wars drew in significant numbers of neighbouring African kingdoms and led to replacement of the gold trade with enslaved Africans. After the Fourth Anglo-Dutch War, it became apparent that the Dutch West India Company was no longer capable of defending its own colonies, as Sint Eustatius, Berbice, Essequibo, Demerara, and some forts on the Dutch Gold Coast were rapidly taken by the British. In 1791, the company's stock was bought by the Dutch government, and on 1 January 1792, all territories previously held by the Dutch West India Company reverted to the rule of the States General of the Dutch Republic. Around 1800 there was an attempt to create a third West Indian Company, without any success. ^ Franklin J. Jameson (1887). Willem Usselinx, Founder of the Dutch and Swedish West India Companies. Ryan Gregory University, New York. ^ Charles R. Boxer, 'The Dutch in Brazil, 1624-1654'. Oxford: Clarendon Press 1957. ^ Boxer, C. R. (Charles Ralph), (1973). The Dutch seaborne empire, 1600-1800. Harmondsworth: Penguin. p. 27. ISBN 0140216006. OCLC 16253529. ^ a b c d "Freedoms, as Given by the Council of the Nineteen of the Chartered West India Company to All those who Want to Establish a Colony in New Netherland". World Digital Library. 1630. Retrieved 2013-07-28. ^ Michiel van Groesen, Amsterdam's Atlantic: Print Culture and the Making of Dutch Brazil. Philadelphia: University of Pennsylvania Press 2017, pp. 37–38. ^ Charles R. Boxer, The Dutch in Brazil, 1724-1654. Oxford: Clarendon Press 1957, pp. 10-11. ^ Boxer, The Dutch in Brazil, p. 12. ^ Boxer, The Dutch in Brazil, pp. 12–13. ^ Boxer, The Dutch in Brazil, p. 13. ^ Boxer, The Dutch in Brazil, pp. 13–14. ^ (in Dutch)Klein, P.W. (1965) De Trippen in de 17e eeuw, p. 150. ^ Jonathan I. Israel, The Dutch Republic and the Hispanic World, 1606-1661. Oxford: Clarendon Press 1982, p. 197. ^ Israel, The Dutch Republic and the Hispanic World, pp. 198–99. ^ Israel, The Dutch Republic and the Hispanic World, pp. 201–02. ^ Israel, The Dutch Republic and the Hispanic World, p. 203. ^ Israel, The Dutch Republic and the Hispanic World, p. 204. ^ "Conditions as Created by their Lords Burgomasters of Amsterdam". World Digital Library. 1656. Retrieved 2013-07-28. ^ (in Dutch)Heijer, H. den (1994) De geschiedenis van de WIC, p. 97. ^ (in Dutch)Dillen, J.G. van, (1970) Van Rijkdom tot Regenten, p. 169. ^ (in Dutch)Dillen, J.G. van, (1970) Van Rijkdom tot Regenten, p. 127. ^ (in Dutch) Brakel, S. van (1918) Bescheiden over den slavenhandel der Westindische Compagnie, p. 50, 67. In: Economisch-Historisch Jaarboek IV. ^ (in Dutch)Binder, F. e.a. Archived 2006-05-17 at the Wayback Machine (1979) Dirck Dircksz. Wilre en Willem Godschalk van Focquenbroch(?) Geschilderd door Pieter de Wit te Elmina in 1669. Bulletin van het Rijksmuseum 27, p.7–29. ^ (in Dutch)Klein, P.W. (1965) De Trippen in de 17e eeuw, p. 182. Boxer, Charles R., The Dutch in Brazil, 1624-1654. Oxford: Clarendon Press 1957. Ebert, Christopher. "Dutch Trade with Brazil before the Dutch West India Company, 1587–1621." Riches from Atlantic Commerce: Dutch Transatlantic Trade and Shipping (2003): 1585-1817. Emmer, Pieter C. "The West India Company, 1621–1791: Dutch or Atlantic?." Companies and trade: Essays on overseas trading companies during the ancien régime (1981): 71–95. Emmer, Pieter C. The Dutch in the Atlantic economy, 1580-1880: Trade, slavery and emancipation. Vol. 614. Variorum, 1998. Frijhoff, W. Th M. "The West India Company and the Reformed Church: Neglect or Concern?." (1997). Groesen, Michiel van, (ed.) "The Legacy of Dutch Brazil", Cambridge University Press, 2014. Groesen, Michiel van "Amsterdam's Atlantic: Print Culture and the Making of Dutch Brazil", University of Pennsylvania Press, 2017. Heijer, Henk den. "The Dutch West India Company, 1621–1791." in Johannes Postma and Victor Enthoven, eds. Riches From Atlantic Commerce: Dutch Transatlantic Trade and Shipping, 1585-1817. Leiden: Brill 2003, 77–114. _________. "The West African Trade of the Dutch West Indian Company 1674-1740," in Postma and Enthoven, eds. Riches from Atlantic Commerce, pp. Leiden: Brill 2003, pp. 139–69. Klooster, Wim. The Dutch Moment: War, Trade, and Settlement in the Seventeenth-Century Atlantic World. (Cornell University Press, 2016). 419 pp. Meuwese, Marcus P. " For the Peace and Well-Being of the Country": Intercultural Mediators and Dutch-Indian Relations in New Netherland and Dutch Brazil, 1600-1664. Diss. University of Notre Dame, 2003. Nederlof, Marjo (2008). Eerlijckman - 1680-1713: in dienst van het Staatse leger en de West-Indische Compagnie. Curaçao: De Curaçaosche Courant. ISBN 9789990408201. Peltries or plantations: the economic policies of the Dutch West India Company in New Netherland, 1623-1639. Baltimore: Johns Hopkins Press, 1969. Pijning, Erst. "Idealism and Power: The Dutch West India Company in the Brazil trade (1630-1654)," in Allen L. Macinnes and Arthur H. William (eds.) Shaping the Stuart World, 1603-1714: The Atlantic Connection. Leiden: Brill 2006, 207–32. Postma, Johannes. "West-African Exports and the Dutch West India Company, 1675–1731." Economisch-en sociaal-historisch jaarboek 36 (1973). Postma, Johannes. "The dimension of the Dutch slave trade from Western Africa." The Journal of African History 13.02 (1972): 237–248. Rink, Oliver A. "Private Interest and Godly Gain: The West India Company and the Dutch Reformed Church in New Netherland, 1624-1664." New York History 75.3 (1994): 245. Ryder, Alan Frederick Charles. "Dutch trade on the Nigerian coast during the seventeenth century." Journal of the Historical Society of Nigeria 3.2 (1965): 195–210. Rutten, Alphons MG. Dutch transatlantic medicine trade in the eighteenth century under the cover of the West India Company. Erasmus Pub., 2000. Van den Boogaart, Ernst. Infernal Allies: The Dutch West India Company and the Tarairiu, 1631-1654. 1980. Van Hoboken, W. J. "The Dutch West India Company: the political background of its rise and decline." Britain and the Netherlands 1 (1960): 41–61. Visscher, Nic Joh. A Bibliographical and Historical Essay on the Dutch Books and Pamphlets Relating to New-Netherland, and to the Dutch West-India Company and to Its Possessions in Brazil, Angola Etc., as Also on the Maps, Charts, Etc. of New-Netherland. Muller, 1867. Weslager, Clinton Alfred. Dutch explorers, traders and settlers in the Delaware Valley, 1609-1664. University of Pennsylvania Press, 1961. Zandvliet, Kees. Mapping for money: maps, plans, and topographic paintings and their role in Dutch Overseas Expansion during the 16th and 17th Centuries. Amsterdam: Batavian Lion International, 1998. WIC ship halve maan The GWC ship the Halve Maan.